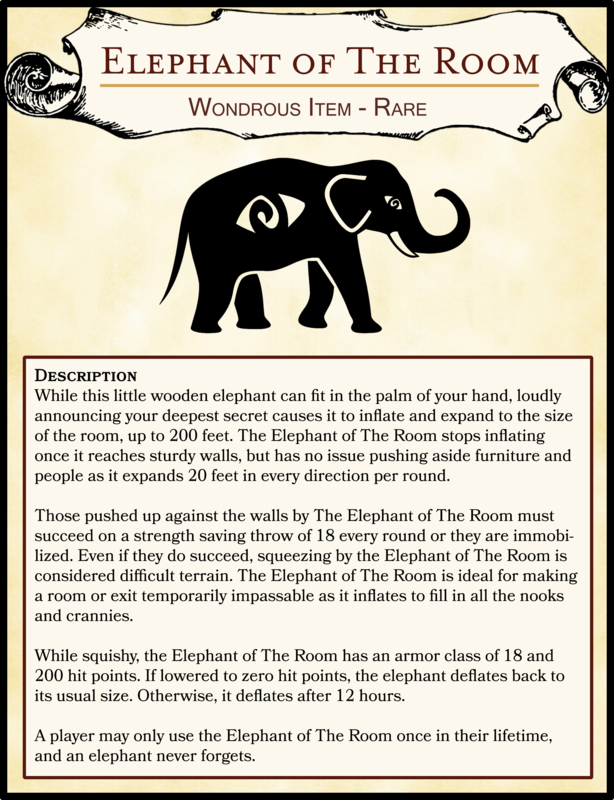 While this little wooden elephant can fit in the palm of your hand, loudly announcing your deepest secret causes it to inflate and expand to the size of the room, up to 200 feet. The Elephant of The Room stops inflating once it reaches sturdy walls, but has no issue pushing aside furniture and people as it expands 20 feet in every direction per round. Those pushed up against the walls by The Elephant of The Room must succeed on a strength saving throw of 18 every round or they are immobilized. Even if they do succeed, squeezing by the Elephant of The Room is considered difficult terrain. The Elephant of The Room is ideal for making a room or exit temporarily impassable as it inflates to fill in all the nooks and crannies. While squishy, the Elephant of The Room has an armor class of 18 and 200 hit points. If lowered to zero hit points, the elephant deflates back to its usual size. Otherwise, it deflates after 12 hours. A player may only use the Elephant of The Room once in their lifetime, and an elephant never forgets.